St. Joseph's Day has the strongest roots and traditions in Italy and it commemorates the feast day of St. Joseph, husband of the Virgin Mary. Besides being celebrated by the Catholic Church, St. Joseph's Day is commemorated by the Anglican Community and Lutheran Church. On Western calendars since the 10th century, St. Joseph's Day was accepted in Rome in 1479 and added to the General Roman Calendar for celebration in 1621. Italian-Americans hold St. Joseph's Day with a special importance, especially those with family from Sicily, "where St. Joseph is as important as St. Patrick is in Ireland. St. Joseph was credited with preventing a famine in Sicily. The day is commonly commemorated with a festival, special feast, parades and processions. Traditionally, red is worn on St. Joseph's Day. 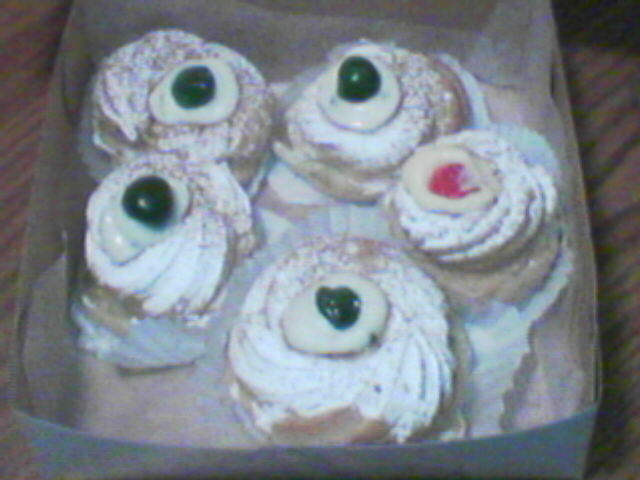 E-mail me your Favorite St. Joseph's Day Family Recipes & I'll post them here! Cut open the vanilla bean lengthwise. Using the back of a knife, scrape along the inside of the vanilla bean to collect the seeds. Scrape vanilla bean seeds into a small bowl. Add the 1/2 cup sugar and cinnamon and stir to combine. Set aside. In a medium saucepan combine the butter, salt, 3 tablespoons of sugar, and water over medium heat. Bring to a boil. Take pan off the heat and stir in the flour. Return pan to the heat and stir continuously until mixture forms a ball, about 3 to 5 minutes. Transfer the flour mixture to a medium bowl. Using an electric hand mixer on low speed, add eggs, 1 at a time, incorporating each egg completely before adding the next. Beat until smooth. If not frying immediately, cover with plastic wrap and reserve in the refrigerator. Meanwhile, pour enough oil into a large frying pan to reach a depth of 2 inches. Heat the oil over medium heat until a deep-fry thermometer registers 375 degrees F.
Using a small ice-cream scooper or 2 small spoons, carefully drop about a tablespoon of the dough into the hot olive oil, frying in batches. Turn the zeppole once or twice, cooking until golden and puffed up, about 5 minutes. Drain on paper towels. Toss with cinnamon-sugar. Arrange on a platter and serve immediately.